Our Lawn and Garden Department covers everything from gardening tools to grilling supplies to insect repellent. It's important to have the products you need to make both working and relaxing outside an enjoyable experience. We have landscape fabric in different lengths and widths, and we sell a few different styles of landscape edging. We also have a variety of garden fencing and hardware cloth. Our Richland Center and Muscoda stores sell railroad ties that make excellent landscape edging. We sell all of the basic tools you need to make gardening easier. We have rakes, shovels, spades, forks, wheelbarrows, post hole diggers, trimmers, pruners, axes, picks, and sledgehammers. If you're looking for a specialty garden tool, ask us about it, because chances are we can easily get one for you. We sell soil by Ace, Scotts, Purple Cow, and Miracle Gro for all sizes and kinds of gardens. We also sell cypress mulch, pine mulch, and compost manure. We have grass seed for sun, shade, high traffic, and repair jobs. We sell it in small and large bags, and also in bulk. Some plants require special soil to be healthy. We have several kinds of special soils and treatments, including orchid mix and several kinds of organic potting soil. Our stores get a shipment of field grass and alfalfa seed in each year. Call your local store for information on them. We have many styles of sprayers, including deck sprayers and backpack sprayers. For spreaders, we have hand spreaders and broadcast push spreaders. Not only do we offer a wide assortment of hoses, we also have several hose repair menders and hose adapters. We have several styles of hose nozzles and sprinklers. We also carry hose reels and rain gauges. Whether you want to fertilize a little house plant, or your entire lawn, we have the products you need. We sell fertilizer spikes for trees and shrubs, and plant food spikes for flowers and house plants. We have many different treatments that gardeners swear by, like blood meal, super phosphate, and Osmocote. We sell the Scotts 4-Step lawn fertilizer program. We also have a variety of Ace fertilizers that are specific to your lawn's needs. We have winterizers, 10-10-10, pelletized lime, milorganite, and more. We sell Roundup, Ortho, Bonids, Scotts, Spectracide, Preen, and more brands of weed killer. We have products that kill specific weeds, like poison ivy and crab grass, and products that will deliver a widespread, powerful treatment to your yard. We sell insecticides for all kinds of insects all all kinds of places. 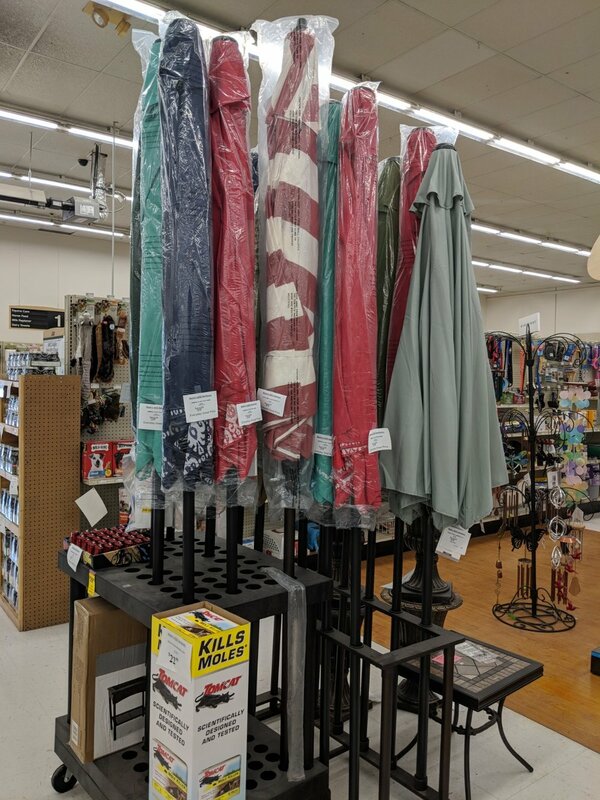 We have citronella candles and torches, bug killing equipment, insect dusts, insect repellents, fly control products, and more. We have rodent and small animal traps, repellents, and poisons. We know different people prefer different approaches to dealing with rodents, so we have a wide variety of solutions for you to try. See information about the grills and grilling supplies we sell on our Grilling page. All four of the Walsh's Ace stores keep a small selection of patio furniture in stock, and we have a much larger selection that we can order in for you. Ask an associate to see what patio furniture Ace has - or check out Acehardware.com to see what we can get for you.